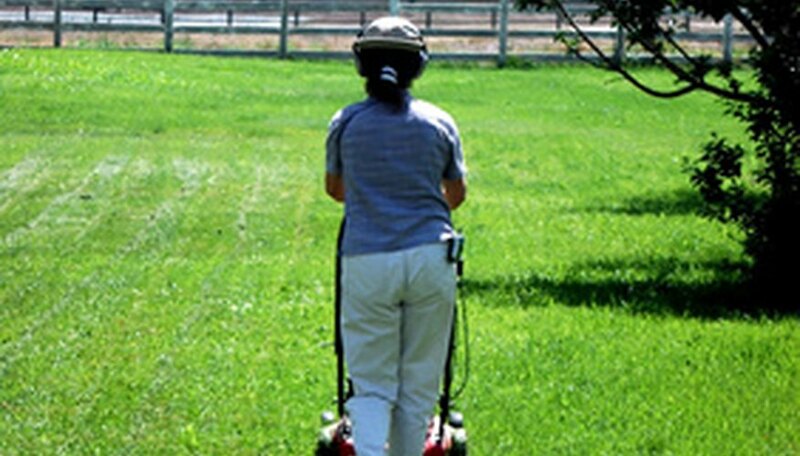 Having a bumpy lawn is a common problem that is readily correctable. Leaving your lawn bumpy can create a multitude of problems for your grass and your own well-being. As you mow your grass, a bumpy lawn will cause your lawn mower to cut some areas of your lawn high while scalping other areas. This can cause disease to enter the scalped areas, which can contribute to its death. Walking across a bumpy lawn can also lead to twisted or broken ankles. Fixing a bumpy lawn is a slow process that can take a few seasons to complete. Fertilize your lawn in the spring. Fill your spreader with fertilizer and set the application rate on the spreader to the indicated rate on the fertilizer bag. Push the spreader over the lawn to apply the fertilizer. The fertilizer will thicken the lawn and make the bumpy areas less noticeable. Run a core aerator over your entire lawn. Rake your lawn with a power rake. It will break down the high bumps as well as break down the cores from the core aerator. These cores will settle into the low areas of your lawn. Rake loose material off of the lawn, and bag and dispose of it. Spread grass seed across your lawn using your spreader at the rate indicated on the grass seed bag. Rake the seed into the soil using your leaf rake. Water your grass seed two to three times a day to keep the soil moist until germination occurs. Reduce watering to your normal irrigation schedule when the grass reaches 2 inches high. Refrain from using a lawn roller to attempt to smooth out your lawn. The lawn roller will compact your soil, which will lead to further turf problems. Try topdressing the low areas of your lawn with 1/2-inch of soil at a time. Add the soil, wait for the lawn to grow through the soil, then repeat the process. Over time, the low areas will raise up.